One of the primary objectives of Nigeria’s oil and gas industry reform has been to create a more efficient state-owned oil company (“SOC”). Government officials have often named the SOCs of Brazil – Petrobras, Norway – Statoil and Malaysia – Petronas, amongst others, as comparator companies on which the restructured national oil company would be modelled. The various drafts of the Petroleum Industry Bill (“PIB”) have proposed different reform alternatives culminating in the structural reform proposed in the Petroleum Industry Bill 2012 (the “Bill”). This article seeks to review the reform structure proposed under the Bill and to critically analyse the choices made. As our title suggests, it is our view that although several changes have been made, the fundamental issues surrounding the inefficiency of the Nigerian National Petroleum Corporation (“NNPC”) remain untouched and will continue to plague the industry in the immediate future if these reforms are passed into law. The NNPC was established by the NNPC Act of 1977 to take over the assets of the Nigerian National Oil Corporation (“NNOC”). Since its establishment, the Corporation has acted as the primary vehicle through which the Nigerian government has carried out its commercial ventures in the Nigerian oil and gas industry. It holds the government’s interests in unincorporated joint ventures (“JVs”), which produce over 60% of Nigeria’s 2.5 million barrels of oil per day (“bopd”). The company is also the leaseholder in a number of Production Sharing Contracts (“PSCs”) and Service Contracts (“SCs”) either directly or through its subsidiary the Nigerian Petroleum Development Company Limited (“NPDC”). Its other subsidiaries cover a range of midstream and downstream activities as well as oil services. The government’s relationship with the Corporation has been characterised by total and absolute control. The NNPC Act lists the directors of the board as the Minister as chairman, the Managing Director of the Corporation, the Director-General of the Federal Ministry of Finance and three other persons appointed by the Federal Executive Council. 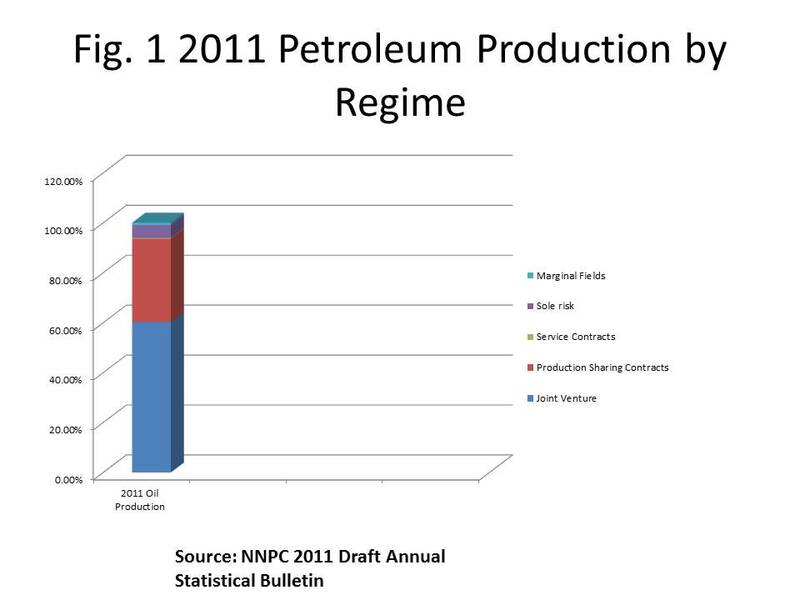 Essentially NNPC has been treated as an integral arm of government than a corporation with a separate identity. This level of control has filtered into the Corporation’s operational decisions greatly inhibiting its ability to carry out its functions in an efficient manner. In the last ten years, NNPC’s Group Managing Director has been changed seven times, often accompanied by changes to the executive management on the orders of the Presidency or the Minister. NNPC’s ability to borrow is circumscribed by the NNPC Act, which provides that it may not borrow above the threshold fixed by the Federal Executive Council and it requires approval where a loan is to be taken in a currency other than Naira, where the loan is “…to be borrowed by the Corporation other than temporarily…”. This provision has significantly hampered the ability of NNPC to seek external funding for its operations. It should be noted that NNPC (Projects) Act sought to allow the corporation to borrow in other currencies, it did not however do away with the requirement to seek approval. NNPC has also been criticised by operators for significant delays in project implementation. 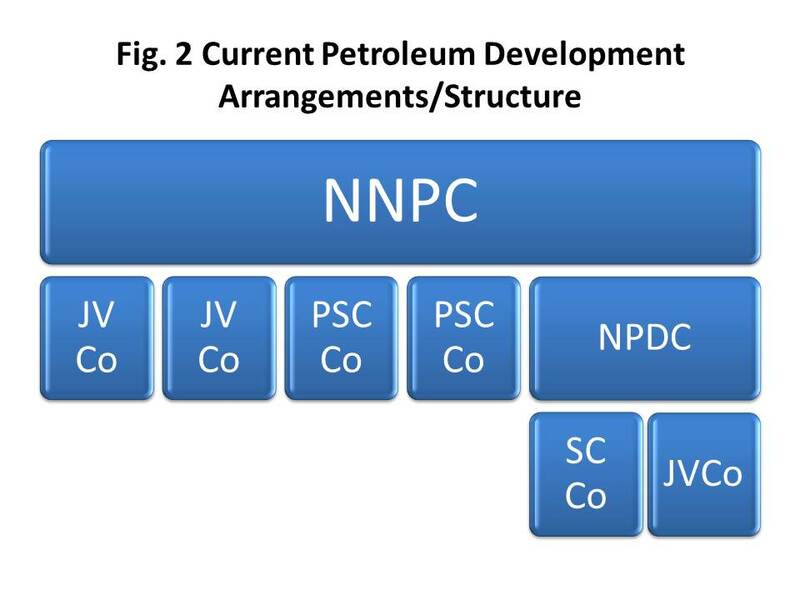 The contract approval process in JVs, PSCs and SCs has been conservatively estimated at taking between 18-24 months, with approvals been sought from NAPIMS, then the board of NNPC, the Federal Executive Council and the National Assembly. This leads to higher project costs as these delays are factored into contract pricing by contractors. As the majority partner in the JVs, NNPC is required to pay its share of the funds utilised in funding JV operations. NNPC’s interests in the JVs are funded by direct budgetary appropriation in competition with other government departments for funding. The limited resources of the Nigerian government have led to JV projects being underfunded and to consequential cuts in exploration and production. This anomalous situation has arisen due to the fact that the Corporation is not in control of its revenue streams as a substantial part of the income derived from operations is required to be paid into the Federation Account. Additionally, even where funds are available, there are often significant delays in the budgetary appropriation process. These issues add to the cost of operations and impact the ability to efficiently carry out JV projects. Due to funding problems and centralised operational decision making, amongst other factors, NNPC’s subsidiaries have suffered and have not fulfilled their primary objectives. The refineries have failed – consistently operating well below capacity and petroleum products pipelines and depots are virtually moribund. This contrasts with the only NNPC subsidiary to have been privatised Eleme Petrochemicals Limited which has been very successful post-privatisation and the Nigerian Liquefied Natural Gas Limited (“NLNG”) a company in which NNPC has significant shareholding, but has not exercised dominant control. It should be noted that NETCO & IDSL are generally regarded as commercial successes. This has been explained by the limited opportunities for patronage in these companies, which has allowed them to operate with a greater degree of independence. The NNPC Act formally requires NNPC to prepare and submit audited accounts of the Corporation for each year to the President. There is no requirement that these be made public. NNPC’s accounts have over the years been a subject of controversy with accusations and counter-accusations from the Central Bank of Nigeria, the Federal Ministry of Finance and the Presidency about the authenticity of the accounts. In 2012 alone, the Auditor General of the Federation has indicted the corporation on the state of its accounts, and NNPC has been accused by the Senate of maintaining a secret account! These accusations have been denied by NNPC here and here. Recent reports have however indicated that NNPC has been used as a slush fund by the Government and has provided unauthorised loans, the recovery of which is doubtful. There are also challenges in relation to transparency particularly in relation to the management of crude oil disposals and the procurement of petroleum products which have been described as particularly opaque. For the purpose of this section, I have focused on the provisions of the Petroleum Industry Bill 2008 (“PIB 08”) and the the Inter Agency Team Draft (“IATD”). PIB 08 & IATD provided for the corporatisation of NNPC as a limited liability company under the Companies and Allied Matters Act (“CAMA”). Under the proposed structure the assets and liabilities of NNPC would be transferred to NNPC Ltd, the newly created company. In varying degrees, the versions provided for corporate governance of the proposed NNPC Ltd and 100% ownership by the Federal Government, which may be divested on the stock exchange after a number of years. Both drafts also proposed the incorporation of the joint ventures under CAMA. One of the objectives behind this proposal was to create self-funding organisations, which would not need to rely on government funds to run their operations. The IATD went further than the PIB 08 including prescribing the percentage of the management team to be nominated by the NNPC, imposing restrictions on the ability of IOCs to freely transfer shares in the IJV and dealing with transfer of assets in liquidation. My comparison of the IJV provisions under the IATD and PIB 08 may be found here. Also see Tim Okon’s presentation on the IJV structure here. PIB 08 & IATD also provide for the emergence of the National Transport Logistics Company Ltd (“NTLC”) which would take over the petroleum products pipeline and depot assets of PPMC as well as the gas transportation pipeline assets of NGC. In relation to the product pipeline assets, those were to be divided into regional segments and managed by facility management companies. 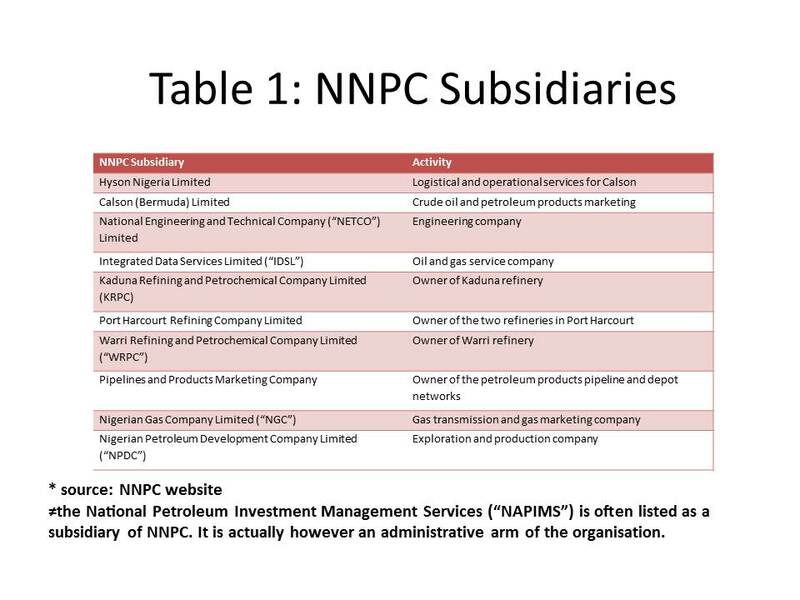 Both drafts do not specifically address any of the other subsidiaries of NNPC. These would have moved to the proposed NNPC Ltd. The Bill provides for wholesale changes to the NNPC and departs significantly from the reform initiatives in the previous drafts of the PIB. In the upstream sector, the Bill proposes the establishment of three organisations to carry out the commercial functions hitherto carried out by NNPC. 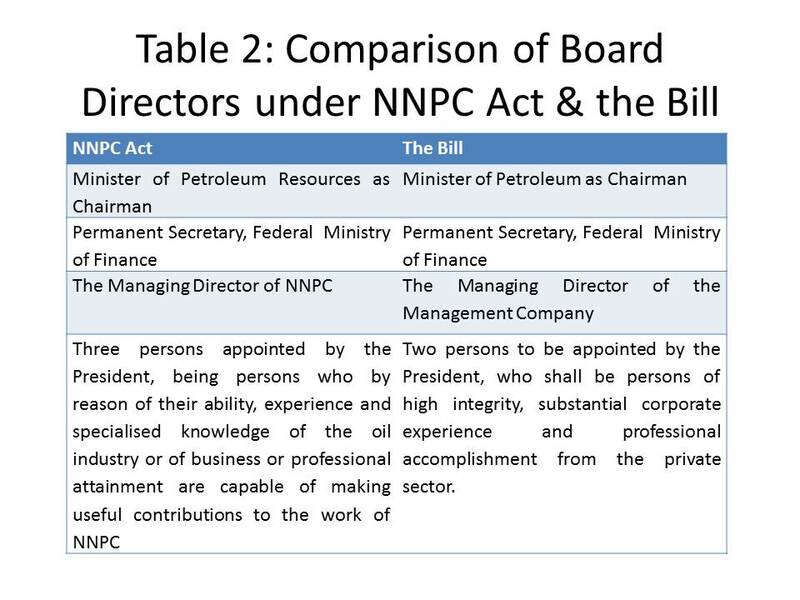 The Bill establishes a statutory corporation, the National Petroleum Assets Management Corporation (the “Corporation”) which is very similar in all respects to the current NNPC and also empowers the minister to incorporate two companies, the Nigerian Petroleum Assets Management Company Ltd (the “Management Company”) and the National Oil Company (“NOC”). The Management Company is to be a subsidiary of the Corporation with 99% of its shares held by the Corporation and the remainder held by the Permanent Secretary of the Ministry (in trust for the Corporation). All assets and liabilities comprising exclusively the interests of NNPC in the JVs save for those vested in the NOC shall be vested in the Management Company. The NOC is to be vested with the assets and liabilities held by NNPC save for those interests in the JVs and the Nigerian Gas Company Limited. 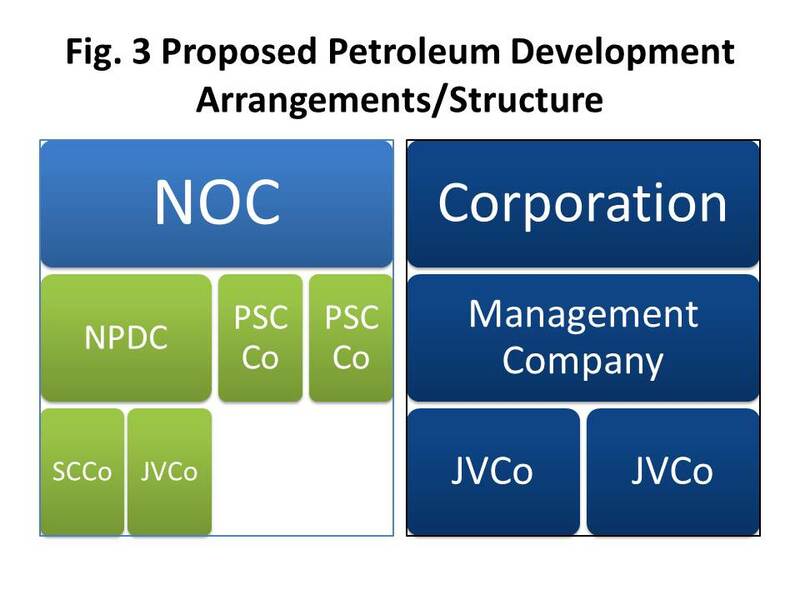 Effectively this would mean in the upstream sector that the Corporation through the Management Company will hold the JV assets, whilst the new NOC will hold the PSC & SC OPLs and OMLs either directly or through NPDC as well as the new JVs between certain indigenous companies and NPDC. In the other sectors in which NNPC has an interest, the new NOC shall be vested with those interests, save for those held in the Nigerian Gas Company Limited. A new National Gas Company Plc (“NGCP”) is to be incorporated. The Bill also provides for the delisting of NNPC subsidiaries from the relevant schedule of the Public Enterprises (Privatisation and Commercialisation) Act (the “Privatisation Act”). 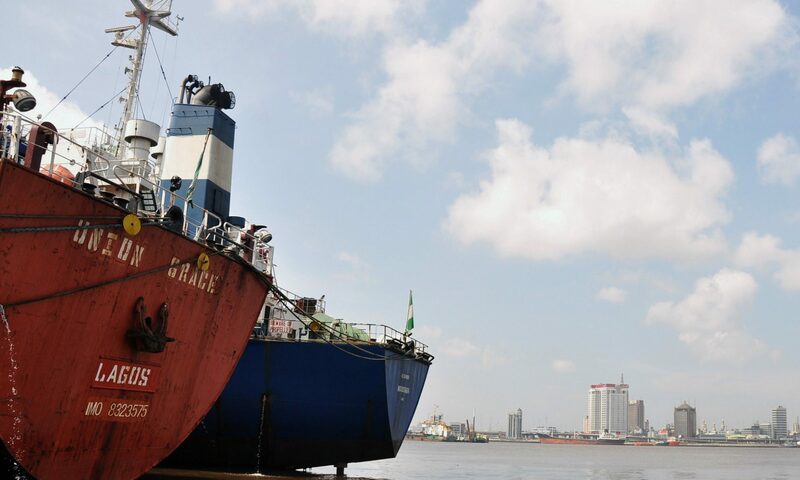 The Privatisation Act lists the three refinery companies, PPMC, NPDC, NGC and Eleme Petrochemicals Company Limited (“EPCL”) for partial privatisation. Of all these companies, only EPCL has been privatised successfully. Under the Bill, the Corporation is to be a holding company “operating fully on commercial principles” and its functions shall be to acquire and manage the government’s investments in the upstream petroleum industry. It is empowered to establish and maintain subsidiaries for the discharge of its functions. Section 121 requires the Corporation to maintain a fund into which sums made available by the Government for the purpose of funding the Corporation’s subsidiaries shall be paid and such monies as may be received by the Corporation in the course of its operations. The proceeds of the Fund are to be utilised for funding the first 2 years work programme of the Management Company and defraying all expenses incurred by the Corporation. Section 130 provides for the borrowing powers of the Corporation. The provisions in this section are very similar to the borrowing provisions under the NNPC Act. The Corporation is allowed to borrow sums of monies as it may require in the exercise of its functions. The President’s approval is required where the Corporation seeks to borrow any sum of money which would take its outstanding loans above the threshold approved by the President. Presidential approval is also required where the Corporation seeks to borrow any sum of money in a currency other than Naira and such sum of money is to be borrowed “other than temporarily”. It is not quite clear what the drafters were aiming to capture in referring to monies borrowed “other than temporarily”. It is however virtually a copy of the provisions of section 8(4) of the NNPC Act. Two persons to be appointed by the President, who shall be persons of high integrity, substantial corporate experience and professional accomplishment from the private sector. Do such other things as are necessary for the efficient performance of its functions. The Corporation is required to keep proper accounts which it shall cause to be audited in accordance with guidelines supplied and auditors approved by the Auditor General of the Federation. It is also required to submit mid-year and annual reports of its finances to the Minister. The annual reports are to be published on the Corporation’s website. The PIB provides for the Minister to take steps to incorporate the NOC under the Companies and Allied Matters Act (“CAMA”) within three months of the passage of the Act. The shares of the company at incorporation are to be held by nominees of the Ministry of Petroleum Resources and the Ministry of Finance Incorporated on behalf of the government. The government is however required to divest up to thirty percent of its interest within six years of the date of incorporation of the NOC. The NOC is exempted from the provisions of the Fiscal Responsibility Act and the Public Procurement Act (the Fiscal Responsibility Act imposes responsibilities on government corporations and majority owned companies in terms of budgetary planning and limitations on their ability to freely borrow monies whilst the Public Procurement Act requires companies with a majority ownership by government to acquire and dispose of property in a laid down manner). Section 156 provides that upon incorporation the NOC will be organised and managed in accordance with its Memorandum & Articles of Association (“Memarts”). The Memarts should deal with directorships etcetera. The Bill does however mandate that the NOC will be subject to the “Governance Rules” of the Securities & Exchange Commission. The Bill does not specifically include provisions to ensure transparency and accountability by the NOC. However as a company incorporated under CAMA, the NOC will be bound by its provisions including the requirements to file annual accounts at the Corporate Affairs Commission (“CAC”) which will be publicly available for anyone interested in reviewing the documents. CAMA also makes provisions for membership of the company, the appointment and dismissal of directors, insolvency, company reconstructions, etcetera by which the NOC will be bound. The Management Company is to be incorporated under CAMA within three months of the passage of the Bill. As previously stated, it is to be a subsidiary of the Corporation, which will hold ninety nine percent of its shares, with the remainder being held by the permanent Secretary of the Ministry in trust for the Corporation. The Management Company is exempt from the provisions of the Fiscal Responsibility Act and the Public Procurement Act. The Bill does not specifically provide for accountability/transparency or impose governance obligations on the Management Company. It does however require it to provide full administrative support for the work of the Board of the Corporation. The PIB provides for the Minister to take steps to incorporate the NGCP under the Companies and Allied Matters Act (“CAMA”) within three months of the passage of the Act. The shares of the company at incorporation are to be held by nominees of the Ministry of Petroleum Resources and the Ministry of Finance Incorporated on behalf of the government. The Bill provides for the NGCP to be vested with the “…assets and liabilities held by NNPC on behalf of the Federal Government of Nigeria except Nigeria Gas Company Plc…” This appears to be an error by the drafters of the Bill. In our view the intent is to transfer the assets and liabilities currently held by NGC. This error must be corrected to reflect the true intentions. 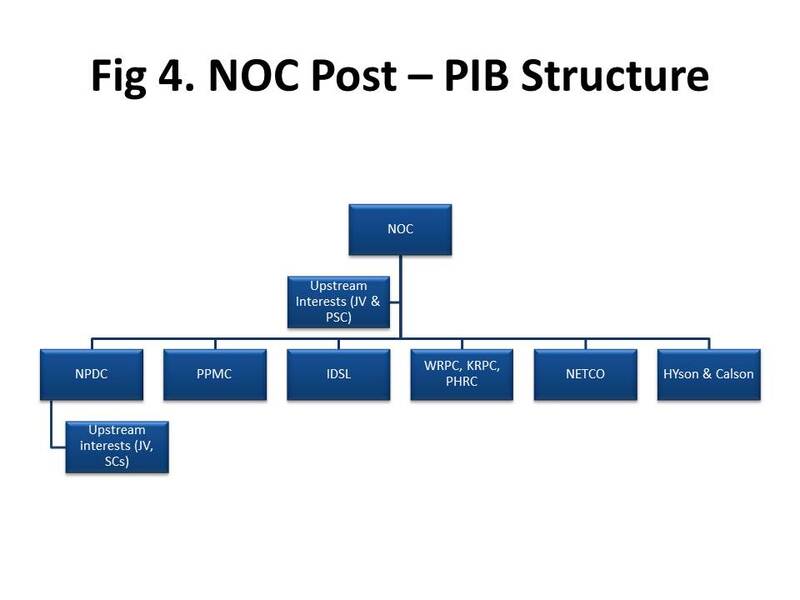 Similar to the NOC, the government is required to divest up to thirty percent of its interest within six years of the date of incorporation of the NGCP. The NGCP is exempted from the provisions of the Fiscal Responsibility Act and the Public Procurement Act. The Bill does not specifically impose for accountability/transparency obligations on the Management Company. It does however provide that the NGCP will be organised and managed in accordance with its Memorandum & Articles of Association (“Memarts”) and will be subject to the “Governance Rules” of the Securities & Exchange Commission. One of the major problems associated with the current regime is the ability of NNPC to fully fund its JV cash call obligations. The Bill does not address this issue in a meaningful way. Under the proposed structures, the JV assets are transferred to the Management Company which is a subsidiary of the Corporation. The activities of the Management Company are funded by the Corporation, which in turn is funded through direct budgetary allocation. The only difference from the current structure is that it essentially adds another layer of bureaucracy. Whilst the borrowing power of the Management Company is not clear, its holding company, the Corporation, is restricted from borrowing in the same manner as NNPC. Additionally, the Bill does not specifically address whether the Management Company or the Corporation will be allowed to retain the proceeds of JV operations for further investment or whether this will be sent back to the national treasury as has been the case with NNPC. The Board of the Corporation is appointed by the President and its Chief Executive as well as those of the other companies established under the Bill are appointed by the President on the advice of the Minister. The Minister sits as Chairman of the Board of the Corporation which is responsible for amongst other things overseeing the affairs of the subsidiaries of the Corporation. This extensive power of the Board allowing it to get involved in the affairs of the subsidiaries may be utilised in interfering in JV operations and budget decisions for example. Therefore the ambit for continued political interference is wide under the Bill with respect to the activities of the Corporation and the Management Company responsible for holding the government’s interests in the JV assets. In the case of the National Oil Company & the NGCP, the Bill provides opportunities to establish a good governance regime. It allows the company to be governed by CAMA, which provides widely accepted governance mechanisms. In addition, the Bill binds the NOC/NGCP to the Securities and Exchange Commission’s Code of Corporate Governance, which currently embodies corporate governance best practice in Nigeria. These mechanisms are however only useful if properly employed. It should be noted that incorporation of a state owned company under CAMA is no guarantee that its provisions will be utilised. The government has often ignored CAMA with respect to its incorporated companies, where its provisions are found inconvenient. Indeed a number of NNPC’s subsidiaries are currently incorporated under CAMA and there is little evidence to suggest that its processes have been followed in for example the appointment and dismissal of directors, the filing of annual returns and other obligations imposed on incorporated companies. Even where CAMA’s rules are followed, as the company is one hundred per cent government owned, it would require strong political will and the exercise of discipline in the selection of directors to ensure the independence of the boards and ultimately the NOC/NGCP itself. The Bill includes provisions to engender transparency. This includes the requirement to publish the Corporation’s accounts on its website. If adopted, this would allow the public to appreciate the state of the Corporation’s finances. Additionally the companies to be incorporated under the Bill would be required to file annual accounts at the CAC (the caveats above regarding the history of government compliance with these provisions should be noted). It does appear absurd however to require the Corporation to submit reports of its activities to the Minister, who will be its chairman – a case of acting as a judge in one’s own matter. This certainly does not facilitate accountability. Further, the Bill does not address the issue of transparency in the Corporation and the NOC’s dealings with the disposal of crude oil. The fact that the Bill removes the NOC’s activities from the ambit of the Public Procurement Act does not help. Whilst it is understood that the reasoning behind this is so that the provisions do not impact on the efficiency of the NOC’s operations, it is submitted that it would be necessary to require the company to operate under at least some general principles of transparency in making such disposals. Another criticism of the proposed reform structures is its failure to address the many challenges facing NNPC’s subsidiaries, which are to be transferred to the NOC. A number of these subsidiaries are operationally insolvent and have suffered from lack of funding and operational inefficiencies. Despite the significant monies that have been expended on turn around maintenance, the refineries have operated well below capacity and most of the petroleum products pipelines and depots operated by PPMC are moribund. The proposed partial privatisation of these companies under the Privatisation Act, in response to these challenges, have been resisted by the NNPC since the enactment of the Act and have now under the Bill been terminated in relation to NNPC’s subsidiaries. Thus keeping faith with a structure that is widely accepted as a failure (even the oil unions have called for privatisation with a minority government stake). The treatment of the Nigerian/National Gas Company in the Bill is also disappointing. The current NGC acts as the monopoly gas transmission company and provides gas distribution services directly as well as through Build Operate Transfer (“BOT”) franchises with gas distribution companies including Oando and Shell Natural Gas. The Bill is silent on whether NGCP should continue in this dual capacity. In view of the investments required to develop Nigeria’s natural gas framework, continued state monopoly of the transmission network is undesirable. The proposed creation of NGCP is also an inefficient means to achieve the proposed structures. NGC, which currently holds the assets and liabilities proposed to be transferred to NGCP is an existing limited liability company. It would be more efficient to achieve this within the framework of CAMA by transferring the shares in NGCL to the relevant nominees as it currently holds the assets to be transferred. The provisions of law in and of themselves are not guarantors of reform. A lot will depend on the actions of the principal actors and the regulators. The legal provisions however provide a basis upon which actions may be measured and indeed challenged. It is therefore critical that reform initiatives in legal documents represent a considered view of the structures required to cure specific issues. My review of the “reform” provisions in the Bill clearly demonstrate that the Government is unwilling to give up its suffocating control over the operations of its commercial vehicle(s). If these reforms are passed into law as currently drafted, the industry dynamics are unlikely to change and the current inefficiencies and challenges are bound to continue unabated. In a subsequent paper I will consider other reform alternatives. Previous PostPrevious It’s been a while!